If you like Thai cuisine, you have probably tried basil chicken. Basil is an aromatic herb that adds great flavor to practically anything -- scrambled eggs, salads, sandwiches, pastas, cocktails, iced teas - the list goes on. Basil even serves as a natural bug repellent in gardens. Reportedly, the Greek word “basileus” means “kingly” or “royal.” Makes sense, considering this herb has been found in tombs of Egyptian kings. This herb belongs to the Lamiaceae plant family, along with mint, rosemary, lavender and oregano. Basil is sometimes called “summer’s herb,” because summer is peak basil season. Lemon. Has notes of citrus. Clove. Very fragrant. Scientific research shows it may have both anesthetic and anthelmintic (able to destroy parasitic worms) effects. Cinnamon. Also known as “Mexican spice basil.” Great for making teas due to its cinnamon taste. Thai. Has an anise, licorice flavor. Purple. As you probably guessed, has a beautiful purple color. Holy. Also called Tulsi basil. Popular in Ayurvedic medicine. “There is mounting evidence that tulsi can address physical, chemical, metabolic and psychological stress through a unique combination of pharmacological actions,” reports the National Institutes of Health (NIH). “While many varieties of basil exist, sweet basil is one of the most predominant and most frequently examined herbs for its health benefits,” according to another report from the NIH. One of these components is eugenol (which is also the main chemical ingredient in clove oil). Research involving human cancer cells found evidence that eugenol induced apoptosis (cell death) in human colorectal and melanoma cells. In addition, basil may lower both blood sugar and blood pressure. Basil may also help clear up your acne. 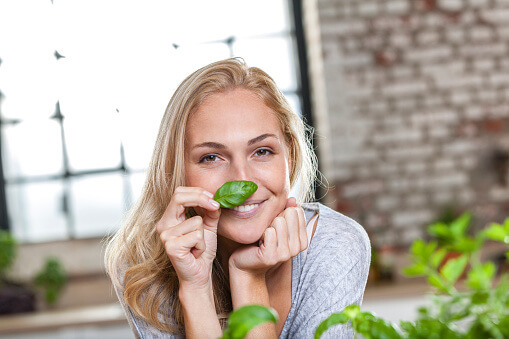 According to this NIH report, certain types of basil oil may help with the treatment of acne. However, if you suffer from acne, consult your dermatologist before attempting to treat your acne with basil oil. Other studies have shown that consuming basil lowered oxidative damage (stress) in animal models. Oxidative stress may contribute to accelerated aging, cancer, autoimmune disorders, cataracts, rheumatoid arthritis, cardiovascular and neurodegenerative diseases. Now, let’s look at some of the specific nutrients basil contains. “Basil is a powerful antioxidant and a rich source of calcium, potassium and iron. One teaspoon supplies 85 percent of your daily vitamin K intake,” according to Cleveland Clinic. Calcium, 177 mg. You probably know calcium is critical for building and maintaining strong bones and teeth. What you may not know is this mineral may decrease your risk for colorectal cancer. Recent studies confirm that high calcium intake is associated with a lower risk of colorectal cancer among both men and women. Magnesium, 64 mg. This mineral helps regulate blood pressure, contributes to bone metabolism and has antioxidant functions. Magnesium is also great for pain management. Many people use magnesium as a safe alternative to ibuprofen or acetaminophen. Magnesium may even help alleviate leg cramps women may experience during pregnancy. Phosphorus, 56 mg. This mineral often does not get the credit it deserves, but it does so much for your body. Phosphorus is almost as abundant in your body as calcium and helps calcium build strong bones and teeth. Phosphorus is also important for how your body stores and uses energy, repairs cells and is needed to make proteins like the one responsible for the oxygen-carrying capabilities of our red blood cells. Potassium, 295 mg. This must-have mineral works with sodium to balance the fluids and electrolytes in the body. Potassium helps keep blood pressure under control and may even help reduce kidney stones and bone loss as you age. Vitamin C, 18 mg. You likely know about the immune-boosting benefits of vitamin C, but what about this nutrient’s importance regarding aging? Read here to find out. Folate, 68 mcg. Most adults need about 400 mcg of folate daily. If you are pregnant, you may need more. Folate is essential for cell growth and many other bodily functions. To see how much folate you need, read here. Vitamin A, 5,275 IU. This vitamin is an antioxidant that supports the immune system and is good for skin and eye health. Vitamin A also promotes cell growth. Vitamin K, 414.8 mcg. This vitamin is critical for proper blood clotting and bone metabolism. It may also help maintain brain function, a healthy metabolism and may even help prevent cancer. This herb pairs beautifully with tomatoes, and you can toss basil in a mixed green salad for added flavor and nutrients. Infuse your water with basil, and add some strawberry or blueberry. Who says you can’t have spa water at home or in the office? One of the most popular ways to use basil is by making pesto sauce. If you are vegan or do not eat dairy, simply omit the cheese. You can also check out this delicious pesto chicken recipe complete with step-by-step pictures and detailed instructions. Overall, basil in moderation appears to be safe. If you have health concerns, always consult a competent physician before you use basil oils, as these may lower blood pressure and slow blood clotting. People already taking blood thinner medications should be especially careful and consult a competent healthcare professional. I always recommend caution with any foods, especially for people with existing medical conditions. If you take any medications - prescription or over-the-counter - you always want to avoid a drug interaction. And get advice from your doctor if you are pregnant or breastfeeding.